Most armies, given the choice, prefer NOT to fight their wars and battles in wintertime… It’s cold, miserable, damp and the daylight hours can be very short. All that being said the decision where, and importantly, when armies ‘take to the field’ is usually left for their commanders to decide. Two of the most uncomfortable locations to fight a winter battle or a campaign in was the Eastern Front between 1942 and 1945 and the Ardennes Forest in December 1944. As many collectors know the Sturmgeschutz Ⅲ more commonly referred to as the StuGⅢ was Germany’s second most-produced armoured fighting vehicle during World War 2. Built on the chassis of the already-proven PanzerⅢ, it replaced the Panzer turret with an armoured, fixed superstructure mounting a more powerful 7.5cm main gun. This was originally intended as a mobile assault gun for direct-fire infantry support. Later, the StuGⅢ adopted in addition another role, similar to that of the Jagdpanzer… tank destroyer! As secondary armament the StuGⅢ mounted the tried and tested MG34 machine gun complete with protective shield. Approximately 10,000 StuGⅢ’s of various types were built between 1942 and 1945 with the vast majority being supplied to the Wehrmacht. Small numbers were however sold to Finland, Romania, Bulgaria, Spain and Hungary. A few even turned up in Syria and took part in the 1967 Arab / Israeli War. This “winterized” StuGⅢ has been given by its crew a ‘winter whitewash’ coat of camouflage and could be placed somewhere in the Ardennes during the Battle of the Bulge in December 1944… or perhaps on the Russian Front in the latter half of WW2. SPECIAL NOTE: Just 200 of this version are available and each one comes with a well-wrapped up vehicle commander scanning the horizon for any enemy activity. RnB020 Centurion & His Prisoner – This Centurion, sword in hand, is taking no chances with this captured Celtic warrior. Although trussed up in a heavy wooden stock some prisoners are capable of anything even when ‘locked-up’ in this manner. RnB022 Kneel & Obey – A kneeling Gallic prisoner is told to pay attention and watch the fate of other Roman captives as they are being punished. RnB034 Galloping Gaul – Spear held aloft and ready to be thrown at the hated Roman invaders this mounted Gaul is not impressed by the might of Rome. RnB037 Charging Gaul – Totally unafraid this Gaul charges towards the enemy. RnB039 Shouting Celt – Sword in one hand, shield in the other, this red-haired Celt screams defiance at the enemy. SIX additional reinforcements for the beleaguered garrison still holding off Santa Anna’s army at the little mission in San Antonio, Texas. RTA107 Tennessee Woodsman – One of Davy Crockett’s backwoods volunteers who journeyed with him to Texas to join the fight for Texan independence. RTA108 James Murray Brown – This Pennsylvania native was born in 1800 and moved to Texas in 1835. He took part in the siege of Bexar and became part of the Alamo garrison where he perished on the morning of March 6, 1836. RTA110 The Flagbearer – Micajah Autry, originally from North Carolina was born in 1793 and fought previously in the War of 1812. A well-read and educated man he had been a farmer, teacher and a lawyer before enlisting in the ‘Volunteer Auxiliary Corps of Texas’ in early 1836 just in time to take part in the Alamo struggle. Here he carries one of several flags that are said to have flown over the Alamo itself… This one was the Mexican tricolor complete with ‘1824’ sewn in black in the middle of the tricolour’s white strip. Like all the other defenders he died on the morning of March 6. RTA116 Thomas R. Miller – Tom Millar was a member of the Gonzales Ranging Company of Mounted Volunteers. Under the command of Lieut. George C. Kimble and Capt. Albert Martin, Millar and 30 other men successfully passed through Santa Anna’s besieging army and galloped into the Alamo on February 23, 1836 never to leave. RTA117 George Neggan of South Carolina – Another horseman of the Gonzales Ranging Company armed only with a pistol. RTA120 James C. Gwynne – Originally born in England he moved to Texas from Mississippi where he had been a farmer. At the Alamo he was a member of Capt. William Carey’s artillery company. Here, however, he’s taken up his musket to fire at the attacking Mexican infantry. For 13 years between 1803 and 1816, there was one major British Army unit that primarily consisted of German expatriates… The King’s German Legion. Under overall British command the Legion earned the unique distinction of being the only German military force to fight without interruption against the French during the Napoleonic Wars! After the occupation of Hanover by Napoleon’s troops in 1803 many former Hanoverian officers and soldiers fled to Britain where GeorgeⅢ King of Great Britain was also Elector of Hanover. The King sanctioned a volunteer corps of all arms infantry, artillery and cavalry to be raised and named them, ‘The King’s German Legion’. Soon, it grew to a strength of 14,000 officers and men and played a vital role in Britain’s defeat of the French emperor. Among the Legion’s most famous regiments were two Regiments of Light Dragoons. Here, for the first time, are King & Country’s mounted tribute to these fine German horsemen. NA427 KGL Dragoon w/Sabre Down – Based on a classic illustration of a mounted charging Dragoon of the Napoleonic era this figure looks about to engage an enemy infantryman or perhaps a gunner! NA429 KGL Dragoon Advancing at the Gallup – Based on a classic illustration of a mounted charging Dragoon of the Napoleonic era this figure looks about to engage an enemy infantryman or perhaps a gunner! NA430 KGL Dragoon Charge – You can almost hear the shout as this particular Dragoon charges forward to engage the opposition sabre held menacingly over his head. NA431 KGL Dragoon Moving Forward – This Dragoon rests his sabre on his shoulder as he prepares to change from the gallup to the full charge. Here are some great-looking USMC reinforcements fighting their way into the old Imperial capital. VN043 Hunkered-Down – Another Marine is also interested in seeing what’s just around the next corner. VN044 Wait – One hand stretched back to tell his buddies to halt this Marine is watching and waiting. VN045 Kneeling LAW Gunner – In the close-quarter fighting that took place all over HUE the M72 LAW (Light Anti Tank Weapon) proved invaluable at taking out enemy bunkers, buildings and machine gun ‘nests’… One shot… One kill! VN050 Vietnam War Dog – War dogs could be trained to sniff-out explosives or uncover hidden exits and entrances to underground bunkers and tunnels. This Marine handler and his German Shepherd seem to be on the trail of something… or someone. HK283 Grain & Grocery Store – This three-level façade is typical of the kind of general food store that used to be found all over Hong Kong and other Chinese cities. On display are various kinds of ‘smoked and cured meats’ as well as large display buckets of different types of rice… the main staple of many Asian diets. 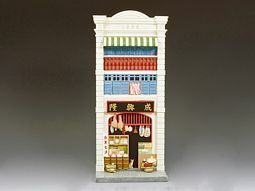 HK286M Chinese Grocer – The perfect ‘companion piece’ for HK283, or indeed any of our traditional Chinese Shop / House facades. Our grocer is dressed in the style of a late 19th Century, businessman… prosperous to show that he is successful but not ‘too prosperous’ to reveal that he might be charging too much for his goods and services!!! Roman-designed pontoon bridges, constructed mostly during wartime for the shock and awe of quick raids, and were a specialty of Julius Caesar’s. In 55 B.C., he built a pontoon bridge that was around 437 yards (400 meters) long to cross the Rhine river, which was traditionally thought by the Germanic tribes to be safely out of reach of Roman power. Roman leader Caligula is well-known for his brief stint as the emperor of Rome, from 37 AD through 41 AD. Some say that Caligula displayed signs of madness during his reign. According to historical accounts, one of these displays of madness was Caligula’s demand for the construction of a floating bridge across the Bay of Baiae so that he could ride triumphantly across it. Some historians dispute the building of this bridge. With differing accounts of exactly what happened during Caligula’s reign as emperor, we may never know whether the floating bridge of Baiae was actually constructed, but it remains a lasting story of power, madness, and what happens when the two intertwine. RRBRIDGE-001 ROMAN PONTOON BRIDGE, BRIDGE SET – Dimensions 29 length x 10 1/4 wide x 3 1/2 height. Please add additional pieces, RRBRIDGE-02 and RRBRIDGE-03, to create a longer bridge. Dimensions 36 length x 10 1/4 wide x 3 1/2 height. RRBRIDGE-003 ROMAN PONTOON BRIDGE, BRIDGE. Please note this is for sale on a pre order basis only. Pre Order period ends March 31st, 2019. Do not miss out.